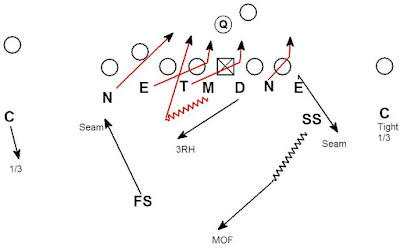 This is an example of the Chiefs running a variation of a traditional zone dog. The Chiefs are running a version of America's Blitz from a Dime personnel package. The end result is a 2 on 1 vs. the running back resulting in a sack. A big part of what makes this concept work is the initial disguise. At this point every offense and pass protection scheme has a plan to block a double a gap rush like the Chiefs initially show. Every offense is also prepared to handle America's blitz. The key to success for this pressure is the offense failing to identify that America's blitz is what is coming. Earlier in the game Chiefs' Defensive Coordinator Bob Sutton showed the same look. The Mike bailed to execute a zone drop off the #3 receiver. On this sack the initial look with two 3 techniques combined with the Mike bailing are both indicators that America's blitz is NOT a threat. This is an excellent example of a defense exploiting an offense's expectations to create a pressure opportunity. Disguising pressure is a topic I've written about in the past. I think disguise is crucial to keeping a tried and true pressure concept effective once opponents have a good scouting report on your defense. The Double A blitz package seems to be a big trend lately...How applicable is it versus Zone read Spread Attacks? Double A gap pressure can be very effective vs. inside zone run schemes. The issue for defenses vs. spread is very rarely will a spread team actually run vs. a Double A blitz look. Most have a bubble or some other mechanism to deal with a pressure look or any other 6 man box defensive look packaged with the zone run. Because they are most likely throwing it, the question becomes how good is your pressure coverage vs. bubble?